Rep. Glen Kolkmeyer is running for re-election in Missouri's 53rd Legislative District, and Russell Kruse is running for Associate Circuit Judge, Division 2, in Lafayette County, Mo. 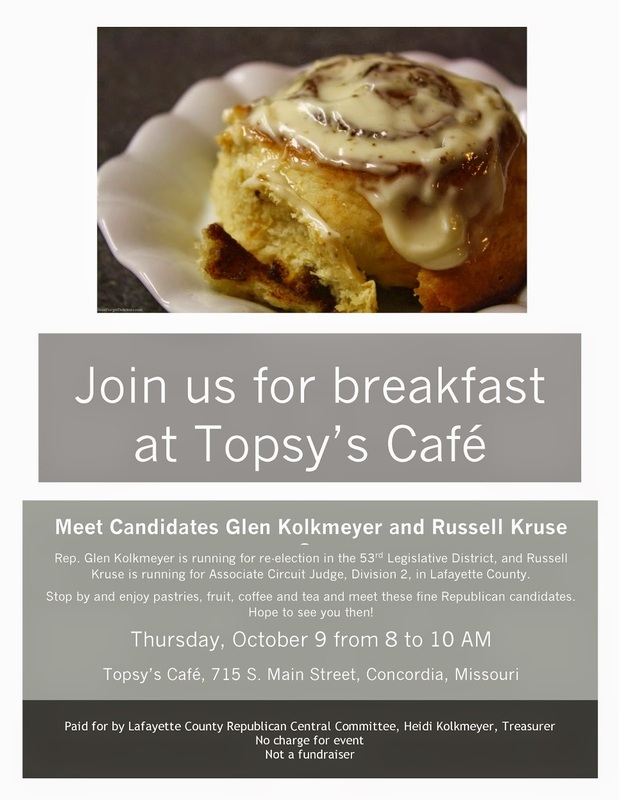 Stop by and enjoy cinnamon rolls, pastries, fruit, coffee and tea, and meet these fine Republican candidates. Russell Kruse, a longtime attorney from Concordia, will explain the role of the Associate Circuit Judge in Division 2 as it exists now and the new scope of Division 2 which will change in January, 2015. At that time, Division 2 will include both probate and juvenile as well as other legal matters. Rep. Glen Kolkmeyer of Odessa will answer questions about the 53rd Legislative District that he serves, about last year’s session as well as what could be ahead in 2015 for the Missouri Legislature. and Federated Republican Women of Lafayette County.